Updated information from the Bureau of Land Management depicts the enormous scale of plans to build solar and wind energy facilities on mostly pristine public land, endangering iconic species such as the desert tortoise and golden eagle, locking up prized outdoor recreation areas, and forever changing the character of California's deserts. The BLM approved a wave of applications in 2010 totaling some 40 square-miles, the most destructive of which continue to face public and legal opposition, and continues to review dozens of additional projects (sampled below) without adequately assessing the cumulative impacts of so much industrial development on desert ecosystems. I've highlighted some great conservation groups in previous blog posts that have devoted a lot of time and passion to desert issues. Desert Protective Council, Basin and Range Watch, Western Lands Project, and Western Watersheds Project, for example. Another great group to check out is Desert Survivors. This non-profit has been around since 1981, advocating for desert conservation, but also organizing hiking and camping trips throughout the southwest. They are also one of the many advocates trying to draw attention to the pitfalls of utility-scale solar on pristine public land, and the benefits of investing in distributed generation (e.g. rooftop solar) instead. 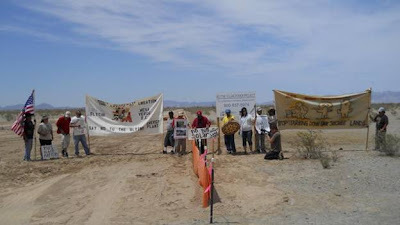 Most recently they held an educational protest outside the headquarters of BrightSource Energy, which is building a 5.6 square miles solar facility that is expected to displace or kill hundreds of desert tortoises. Earlier this month I wrote about about legislation that could revolutionize the rooftop solar industry, making it much more accessible to homeowners. The PACE Assessment Protection Act of 2011 (H.R.2599) would allow homeowners to finance a new rooftop solar installation through their property tax assessment, paying for it over time. Another bill worth calling attention to is the 10 Million Solar Rooftops Act of 2011 (S.1108), which would establish competitive grants to encourage municipalities and local utilities to increase distributed solar generation. The aim of the grants would be to streamline local permit processes, and also implement interconnection and net-metering, which would ultimately allow a homeowner to sell excess renewable energy generated by rooftop solar panels back to the grid. California Governor Jerry Brown yesterday told the renewable energy industry he would "crush" citizen opposition to massive solar facilities on pristine wild lands. When a politician publicly vows to "crush" citizen opposition to the energy industry you have to wonder who they work for. Governor Brown should not brush off public outrage at plans to industrialize hundreds of square miles of pristine desert as the "kind of opposition you have to crush. "America wants more renewable energy, but we do not need to abandon democratic principles in order to achieve that goal. California Governor Jerry Brown's office filed a legal brief supporting the destructive Ivanpah Solar Energy Generating System in the northeastern Mojave Desert. 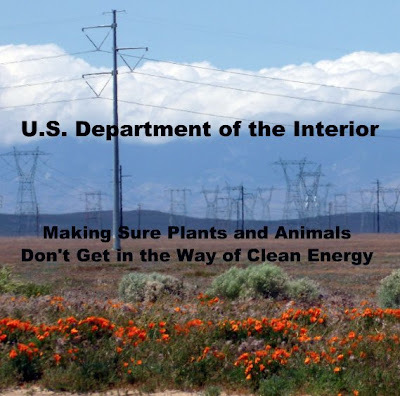 The legal brief was filed in response to a lawsuit from Western Watersheds Project seeking to halt construction of the Ivanpah project on the grounds that the Federal government conducted a faulty and hasty environmental review. Since construction began, it has become clear that the earlier environmental review conducted by California and the Feds vastly underestimated the number of endangered desert tortoises on the project site. Although the Governor is also seeking to increase distributed generation (e.g. rooftop solar), his support for one of the most environmentally destructive solar projects suggests his office does not understand the poor precedent set by the Ivanpah project in destroying pristine desert instead of siting such projects on already-disturbed lands. A bipartisan bill introduced in Congress this month would enable homeowners across the country to install rooftop solar and pay by installments on their local property tax assessment, also known as Property Assessed Clean Energy (PACE). The PACE Assessment Protection Act of 2011 (H.R.2599) would cut red tape placed by Federal mortgage lenders (Fannie Mae, Freddie Mac) and free homeowners to take advantage of local PACE programs. PACE does not involve government subsidies or broad taxes, and at least 27 States have adopted legislation supporting this tool, but are currently held back by the Federal mortgage lenders. Despite studies that wind energy projects are responsible for at least 440,000 bird deaths each year--a number expected to climb to one million by the year 2030--Defenders of Wildlife and the Nature Conservancy have signaled tentative agreement with voluntary wind energy guidelines that would reverse US Fish and Wildlife recommendations to protect birds, according to E&E news. The acquiescence of big environmental groups to energy industry demands is disheartening, underscoring the important role of organizations that work to balance conservation and renewable energy without compromising on core environmental principles, such as Solar Done Right, Western Watersheds Project, and the American Bird Conservancy. A project proposed by New York-based Caithness Energy could degrade or destroy up to 6.8 square miles of public land identified by the Nature Conservancy study as "biologically core" to the health of the Mojave Desert. The Soda Mountain Solar Project would be built on pristine desert habitat--mostly creosote scrub--and would likely disrupt an essential habitat connectivity corridor. Scientists at MIT have developed a way to print solar cells on paper or fabric. Other projects have produced solar cells embedded in roof shingles and windows. 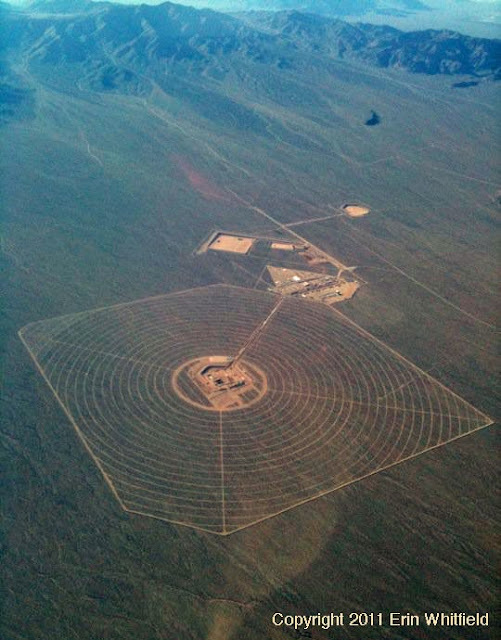 Why are we proposing to bulldoze hundreds of square miles of pristine desert and public land for archaic fields of steel and glass when we can put solar cells just about anywhere else? In our cities, over parking lots...on paper and fabric. Extracting energy resources is taking its toll on all of America's natural resources, including the Mojave Desert. While Big Solar projects destroy pristine desert habitat and deplete ancient groundwater aquifers in the southwestern deserts, natural gas exploration is poisoning water supplies elsewhere. Solar panels on rooftops and a clean glass of water never sounded so good. Stephen Colbert explains (in his own special way), what a joke Big Energy can be when it tries to pretend that it does not come with any negative impacts on the environment. 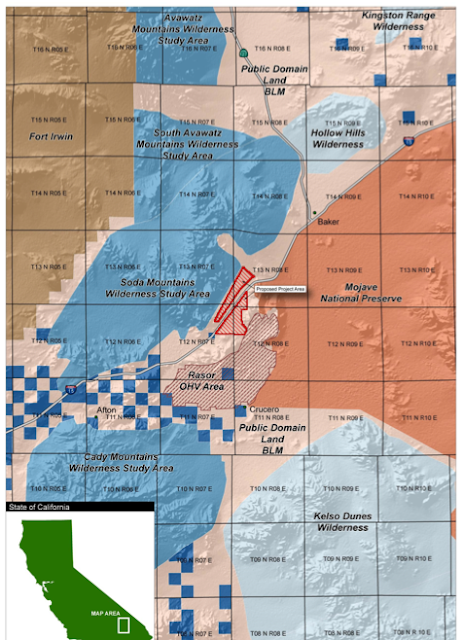 A review of BLM records and industry reports indicate that at least one company is consolidating old mining claims near the beleaguered Ivanpah Valley in the eastern Mojave Desert and preparing plans to start major operations. Most of the claims being acquired date back to the 1950s, when prospectors rushed to the hills skirting the Ivanpah Valley in search of Thorium and Uranium, radioactive elements they obviously anticipated to reap financial rewards in the new nuclear age. Thorium happens to be an element often associated with deposits of rare earth elements (REE), which are used in many of our modern luxuries, including batteries, LED lighting, solar panels, magnets, etc. German firm Solar Millennium LLC, and its American front company ("Solar Trust of America") recently decided to change the proposed Ridgecrest Solar power project from all concentrating solar thermal mirrors to photovoltaic panels (PV), a more economically efficient technology. However, when Solar Millennium asked the California Energy Commission (CEC) for permission to modify its Ridgecrest project to PV technology, the CEC staff declined to continue certification for the project and is likely to relinquish jurisdiction to another authority. The CEC only reviews and certifies thermal energy projects, and PV technology is not classified as thermal. The legal snag is likely to further delay consideration of the project, which the CEC staff previously assessed to be poorly sited and likely to have significant negative impacts on desert wildlife. Here's a shocker. The US House of Representatives Committee on Appropriations released a proposed budget for the Department of Interior that would halt new endangered species listings and gut the US Fish and Wildlife Service budget by 21%. The National Park Service would also see a cut of 129 million dollars from last year's budget. Bottom line: The spending bill would weaken most functions of the government that prevent the extinction of America's natural heritage and destruction of the public's land, while opening the gates to special interests that want to ravage wildlands for private profit. Here is the provision from page 8 of the draft bill that would bring the Endangered Species Act to a halt, preventing any funds from being used to add new plants or wildlife to the list.